“Nikita Pustosvyat. The dispute about faith” – a picture of the famous Russian artist Vasily Grigorievich Perov. The canvas was created between 1880 and 1881, but the story about which it narrates happened on June 5, 1682. In the center of the picture is a simple Orthodox priest Nikita Pustosvyat, who came to the Faceted Chamber of the Moscow Kremlin to take part in a dispute about faith. 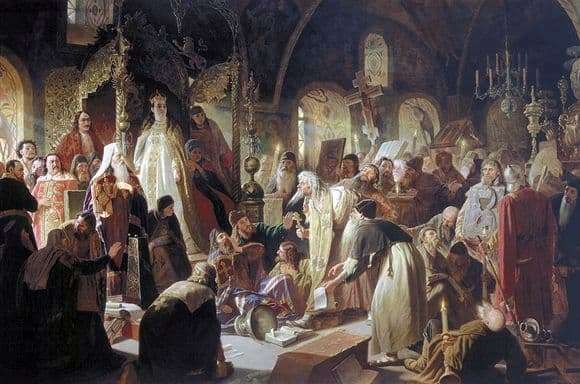 This dispute was started by him, but by the persons present in the picture of the characters – princess Sofia, high-ranking priests and courtiers, it is clearly seen that they are not interested in claims to the church, as well as the church itself. Nikita Pustosvjat accuses priests of complete ignorance of the fact that the holy sayings they use are just words, the meanings of which they practically do not understand. The priest is dressed in a simple robe, belted with a piece of twine, with a black headdress on his head, a half-bent body position, and a scroll in his hands. Despite the fact that the person in the picture is in the servile position, it is clearly visible that he is ready to fight for his convictions to the very end. The people surrounding the priest have their backs turned to the spectator and are on their knees, except for the representatives of the highest clergy and the princess herself. The picture is written in dark tones, it presents the final moment of heated discussions. Those people are tired, detached, it is clear that everyone remained in his opinion. The completion of this story by the artist was not shown. The historical reality itself is depicted by the painter more than impartially; the canvas doesn’t show what the artist’s real feelings are, and how it relates to what is happening is unknown. From historical sources it is known that Nikita Pustosvyat emerged victorious from the controversy started by him. But the very next day, after the events reflected on the canvas occurred, the village priest was captured and executed on the orders of the ruling family. Arguments of reason were powerless against the use of physical strength and ignorance, from which many priests of the described period of history really suffered, who did not possess a literacy and understanding of what they said, but who take to teach others.